What do These Values Mean in the Real World? State the parts of the cardiovascular and respiratory systems and give the functions of each part. Identify the parts of the cardiovascular and respiratory systems on the human torso model and other models. Explain how the respiratory and cardiovascular systems are interrelated. Measure various respiratory volumes using a spirometer. Find the following structures on the human torso model and other models. Use the chart on the next page to help organize your understanding of the different arteries and veins. For each one listed, state where the blood is traveling to and from. 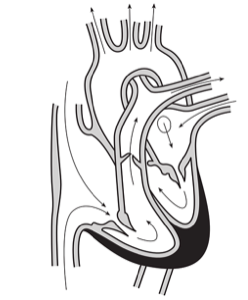 Use the heart picture below and label the different atria and ventricles. Also include the aorta, superior vena cava and inferior vena cava. Spirometry is the classic pulmonary function test. A spirometer is an instrument used to measure how much air and how quickly air is expelled after a deep inhalation. The measurements can be used to calculate how efficiently and how quickly the lungs can be filled upon inspiration and emptied during expiration. The most common measurements obtained from a spirometer are listed in the table below. The spirometer we will use measures peak expiratory flow, a useful indicator of lung function to assess conditions such as asthma. Peak flow is achieved by blowing out as fast as possible after taking in as much air as possible. For best results, stand. If you are unable to stand, sit in a straight and upright position. Move the peak indicator (red internal piece) to the start position (all the way on the left). Hold the spirometer in your hand with your thumb and forefinger on the grips and the mouthpiece facing toward you. Avoid blocking the vent holes as much as possible and do not allow the fingers to interfere with the red peak indicator. Place your mouth on the mouthpiece, past your teeth, and form a tight seal with your lips. Place your tongue below the mouthpiece to make sure it is not blocking the opening at any time. Blow out as hard and fast as you can. The red indicator will move indicating your peak flow. Do not reset the peak indicator. Repeat steps 4-6 two more times for a total of three. The indicator will automatically point to the best of the three efforts. Record your results in the table on the next page. Clean off the spirometer using a paper towel and rubbing alcohol. Have your partner complete the same process. Use the normal predicted average peak expiratory flow tables in the spirometer box and any additional handouts provided by your instructor to compare your readings to expected values based on an individuals gender, age, ethnicity, and height. How does your average PEF compare with the value for a person your age and height? Individuals suffering from obstructive pulmonary disease (narrowed airways) have a low FEV1 but a normal FVC. Since the airways are narrowed less air can be blown out in one second. Individuals with obstructive lung disease also have a FER less than 70% of the predicted value. Asthma is one condition which causes narrowing of the airways. Spirometry is used to diagnose asthma and asses the efficiency of treatments. Individuals can also suffer from restrictive pulmonary disease. These individuals have a normal FEV1 since the airways are unobstructed but a lower FVC. The lower FVC is caused by various conditions that affect the lung tissue or the capacity of the lungs to expand. There are some conditions that involve both lung obstruction and restriction, such as cystic fibrous. Individuals with cystic fibrous secrete excess mucus which narrows the airways and damages the lung tissue. How does body position (laying down verses sitting verses standing) affect your heart rate and your breathing? In the space below, write a hypothesis and null hypothesis for the question. How long your experiment should run? How often should you take measurements? How could you create a control? Use the space below to write out a procedure to test each question. Make sure that your instructor approves your procedures before you begin your experiments. Now begin your experiments. Use the space below to record your results. Feel free to make your own tables to organize your data. How did your heart rate change with body position? When was it the lowest? Highest? How did your breathing rate change with body position? When was it the lowest? Highest? Why might your heart and breathing rate differ from your partner?